Image: "Chris Maas (USA259) at the 2017 Worlds, Pwlhelli. Photo: © Robert Muller"
Image: "Colin Brown (GBR341) at the 2017 Worlds, Pwlhelli. Photo: © Robert Muller"
Image: "Now which bit of boat is where in that photo? 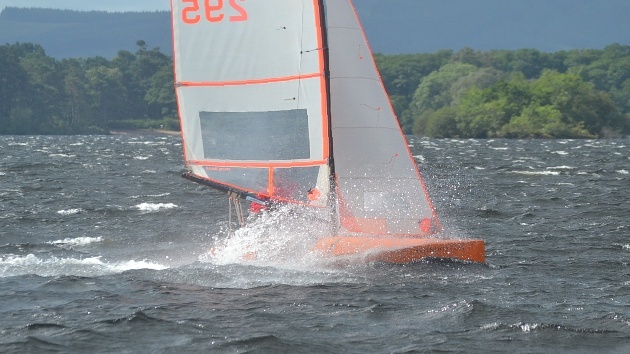 Paul Hignett considers plumbing the depths of Loch Lomond with racing blown off at the 2013 Europa Cup.. Photo: © Loch Lomond SC"
Leo Friede Beats Canadian Craft, Challenger for International Cup. 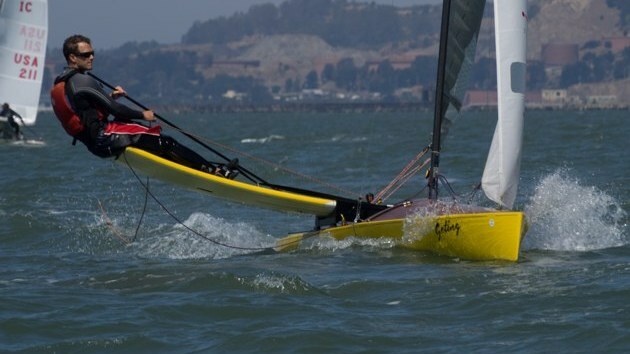 Leo Friede, a member of the Manhattan Canoe Club, representing the United States in the international contests for the historic sailing canoe cup of the New York Canoe Club, won the first leg of the series on Gravesend Bay yesterday afternoon. 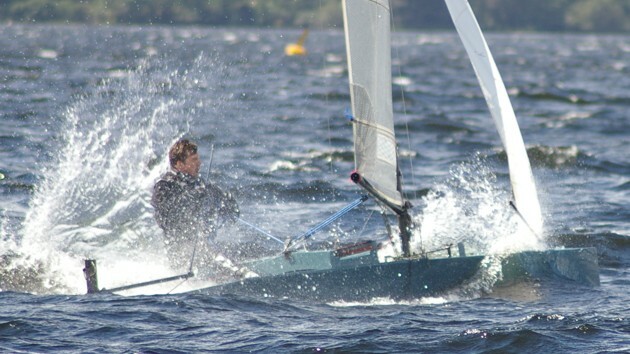 Friede not only defeated Ralph B. Britton, representing the Gananoque Canoe and Motor Boat Club, by 1 minute and 54 seconds actual time, but he also took the race because the Canadian challenger was disqualified for fouling the windward mark on the first of the four rounds of the triangle. 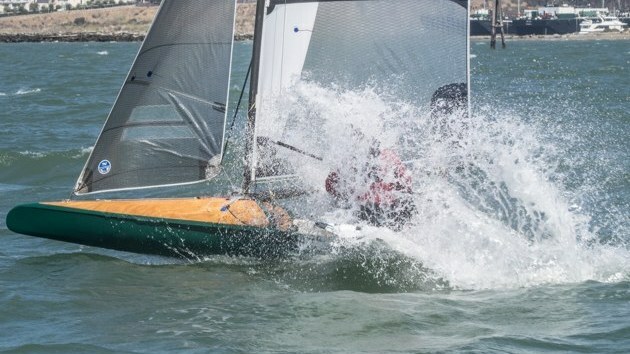 Although Britton reported the foul to the Regatta Committee at the end of the first round, the judges decided to let the two continue around the course. At that hour the American had a comfortable Iead of almost one minute on the Canadian challenger. Not knowing that Brltton had been disqualified, a large fleet of boats continued around the course after the racers and watched the work of the men with the greatest interest. Judge Robert J. Wilkin of the Children's Court fired the starting gun at 3 P. M. At that hour a light breeze was drifting across the lower bay from the southwest. It was the lightest of Summer airs, and hardly filled the sails Of the tiny craft. The Canadian was in his "cheese_box" canoe, with its flat bottom. Friede sailed a handsome mahogany rounded bottom craft that looked decidedly faster than the boat from across the border. The Canadian got the better of the start, crossing the line 10 seconds after the gun was fired. He was at the leeward end of the line. Friede crossed at 3:00:24, nicely berthed to windward of the Canadian. The first leg was a beat to a mark toward Swinburn Island. 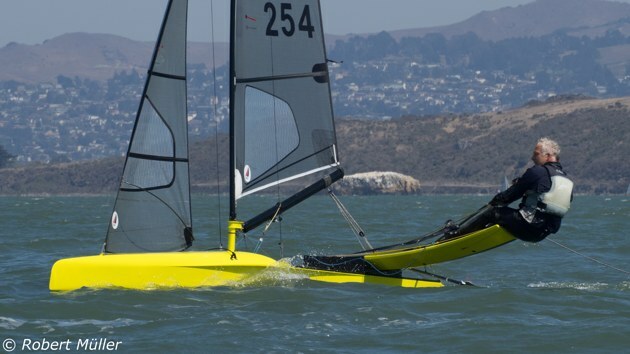 The American's craft footed decidedly faster than the Canadian boat and sailed through her wind on the first board. 'When the craft went over on the port tack Friede had a comfortable lead. At the weather mark he was 35 seconds ahead of the Canadian. It was in trying to round the first mark that Britton stood in too close to the buoy and touched it with his sliding seat. Of course, it at once put him out of the contest. However he continued in the wake of Friede in the broad reach to the mark off Bensonhurst. Here the boats gybed and had another reach to the finish line. The times taken at the end of the first round were Friede, 3:28:35: Britton, 3:30:11. The real struggle came on the second round of the triangle. In the thrash to the weather mark Friede did not stand far enough up to windward and when he came about, he could not fetch the mark. It was necessary for him to make two short hitches before he could turn the buoy. Although he saw the mistake by the American, Brltton also fell short of the mark. Had he stood out into the channel for a few hundred more yards, he would have fetched the mark and saved considerable time. At the end of the second round, the times were Friede, 3:53:10; Britton, 3:54:44. The wind freshened considerably at the end of the third round when the boats were timed at, Friede, 4:18:32; Britton, 4:19:50. Leo Friede Again Beats Canadian R. B. Britten, for International Cup. Still another country has failed to lift a cup. The latest attempt ended yesterday afternoon when Leo Friede, representing the New York Canoe Club, sailed his tiny mahogany craft across the finish line off the Marine and Field Club at Bath Beach two minutes and twelve seconds ahead of Ralph B. Britten, representing the Gananoque Canoe and Motorboat Club, challenger for the historic International Sailing Canoe Cup, which has been kept in this country since it was offered for competition in 1885. The contest yesterday afternoon hardly was a race. Unlike the first trace decided last Friday, which also was won by Friede, the Canadian never had a chance, Friede increasing his lead on every round. Only before the wind did Britton show to any advantage. He managed to make better time than did Friede on the run from the Craven Shoal mark to Bensonhurst. Britton got the better of the start, slipping by the committee at 3:10:15. Friede crossed at 3:10:19, and at once moved up to windward of the Canadian. Britton tried to luff, but Friede established an overlap and forced his way through the Canadian's wind. Inside of the first two hundred yards Friede was in the lead, flying along on the starboard tack like a scared cat. The first leg was a close reach to a mark in the direction of Craven Shoals. Friede jibed at 3:14:30, and Britton went over at 3:14:51, the American having gained twenty-one seconds on the leg. A run followed to Bensonhurst, and at the mark Britten was only four seconds astern of the American. The third leg was on the wind to the finish line. As the boats hauled on the wind Britton was blanketed by a passing craft. It was the only interference of the race. At the end of the first round Friede was leading by 43 seconds. On the second reach toward Craven Shoals, the tug James S. Conway, with a big tow, threatened to bother the canoes. The tug, however slackened speed and went astern of both craft. Friede jibed at 3:30:55, and Britton followed 65 seconds later. Before the wind the Canadian cut down the lead to 55 seconds, but was 1 minute 17 seconds astern at the end of the second round. The breeze freshened as the canoes started the third round of the triangle. Britton had several bad knockdowns, but always managed to right his craft. Friede jibed at the Craven Shoal mark at 3:48:25, and Britton was 2 minutes astern as he rounded the mark for the run to Bensonhurst. Again Britton cut down the lead before the wind and was only 1 minute 35 seconds astern at the next mark. However, he lost 10 more seconds on the beat home. The last round of the triangle saw Britton cutting down the American's lead to 1 minute 39 seconds at the first mark, only to allow Friede to get away from him for the first time going down the wind. As the boats started their last beat for home Friede was leading by 1 minute 45 seconds. He finally won by 2 minutes 12 seconds. These reports were first printed in the New York Times. The understanding of the editor is that works of this age are in the public domain under United States Law. Image: "Ready About! 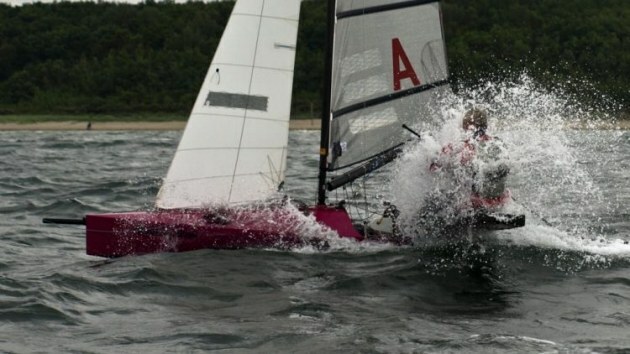 (Tacking for the Windward Mark) Chris Maas (USA246) at the 2011 worlds, Travemunde, Germany. Photo: © Robert Muller"
Image: "Contrast! A 3 Masted Schooner in the backgrouns as Frederik Steimann (GER68) blasts upwind at the 2011 worlds, Travemunde, Germany. Photo: © Robert Muller"
Image: Simon Allen (GBR 278). I love the lighting in this one. 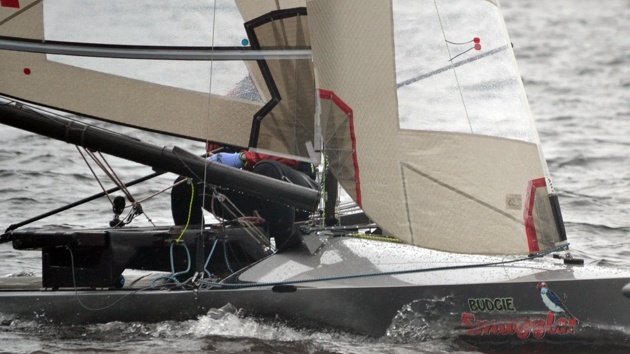 2011 worlds, Travemunde, Germany. 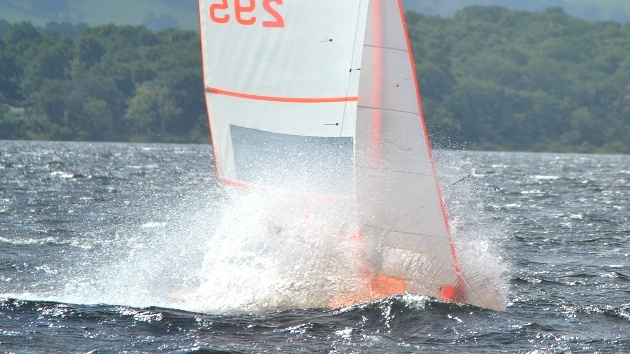 Photo: © Robert Muller"
Image: "Paul Hignett kicks up the spray on the abandoned last day of the 2013 Europa Cup at Loch Lomond.. Photo: © Loch Lomond SC"
Image: "Marei Charlotte Junge (GER60) at the 2011 worlds, Travemunde, Germany. Photo: © Robert Muller"